Annual Assembly of the Metropolitan New York Synod Divests! 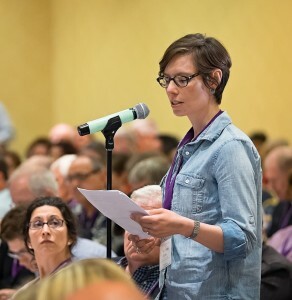 At the end of March, the Annual Assembly of the Metropolitan New York Synod, one of the most populous geographical divisions of the Evangelical Lutheran Church in America (ELCA), resolved to divest from fossil fuels within five years. The Synod Assembly also voted to ask the national body of the church to do the same at the Church-wide Assembly in 2016. We are grateful to leaders from NYIPL who participated in this very significant step forward! The Metro New York Synod now joins the New England and Oregon Synods, as well as many other congregations and religious bodies in the US and abroad, in divesting from coal, oil, and natural gas companies because of their damaging effects on the climate. This religious divestment movement parallels the strong student-led campaign to divest colleges and universities, and�the growing campaign to divest state and municipal pension funds. The Metropolitan NY Synod of the Evangelical Lutheran Church covers the five boroughs of New York City and�Dutchess, Orange, Putnam, Rockland, Sullivan, Ulster, and Westchester counties. The Synod has approximately 64,000 baptized members in 190 congregations served by about 300 pastors and 100 lay leaders. For more information, visit�http://www.mnys.org/. For the texts of the resolutions, go to�http://tinyurl.com/MNYS-ELCA-resolutions.